T'was the day after Christmas and nothing was stirring at the usually busy university belt. So a colleague took advantage of the emptiness to take some thesis photos of her site. Of course, I tagged along, a sucker to take my own pics. I intended to take pics of the old and degraded architecture, but again I was distracted by the tree finds in that part of the metro. No they are not rare species or real plant discoveries. 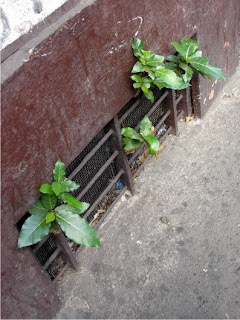 But they are equally interesting because it is a congested area, yet plant life somehow found a way to survive amidst the concrete and synthetic confines. It was also refreshing to find that some establishments still retain areas of their small lots as open spaces. 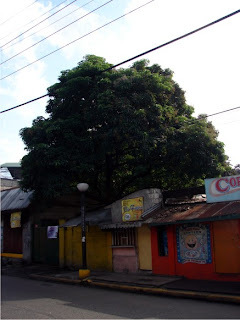 Some talisay trees or Terminalia catappa are used as street planting. 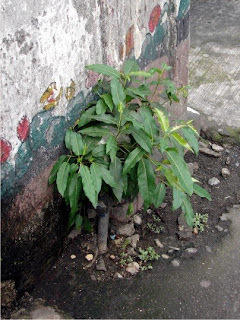 Ficus species are expected as they could grow easily as weeds as their seed are carried out by birds. But you could see the persistence of some Ficus species. 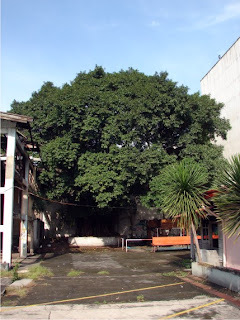 The babulong or Ficus caulocarpa could still grow to humongous proportions in the Gota de Leche compound. Its seedlings grow from cracks where there are available soil. 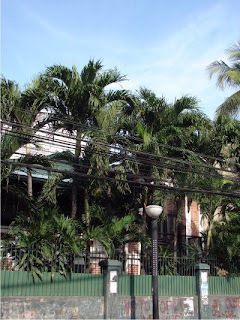 Some old houses made use of the very ornamental Manila Palm or bungang china - Adonidia merrillii, which was a very popular landscape tree even in the Spanish period. It is a shame that the beautiful shape of the palm is very much obstructed by the electric cable entanglement. I was surprised to see molave or Vitex parviflora, and it was in flower. 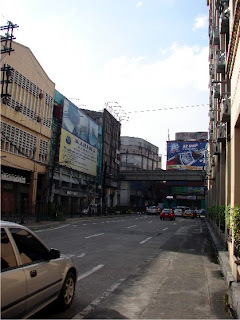 But then again molave and a few other natives were garden favorites in the old Manila areas. Then we entered the UST compound which I always love to visit. They have the last frontier of an open space still very much adorned with green and most importantly full grown trees. 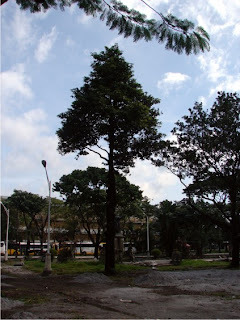 I specially like the UST trees as a lot of them are native and they are labelled (but sorry because some are mislabelled). 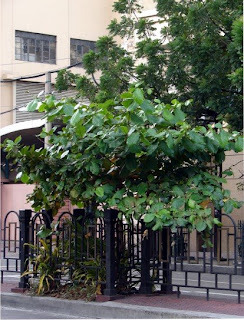 Notable are a few mabolo or kamagong trees (Diospyros blancoi) which stand majestic and shaped like a young dipterocarp. A gem of a tree is located near the UST chapel. 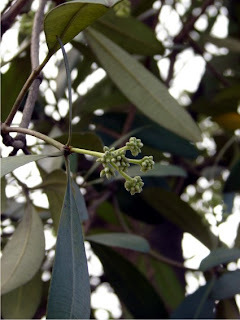 The tree is gakakan or Drypetes falcata, a rather small tree from the Euphorbia family. There are a few lined neatly in front of the chapel building. 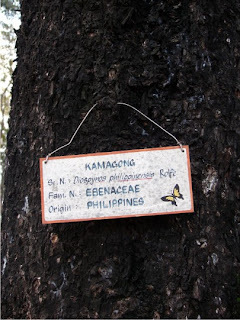 This not-so-popular but very ornamental tree can be found wild in the island of Batanes. But somehow they found their way to landscape gardens and are becoming a good choice for growers to rear in their nurseries - hopefully. 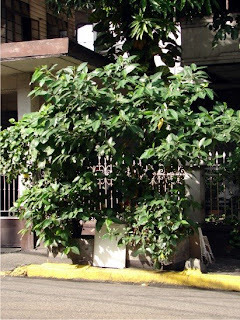 A common tree in UST is dita or Alstonia scholaris. Some of the specimens here are quite old and impressive because of their height and thick trunk diameter. And again most specimens were in flower along the busy Gov. Forbes Avenue. 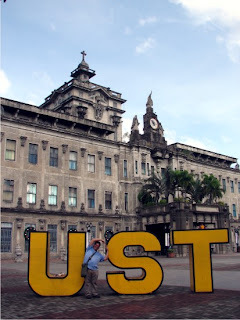 Lastly I have to post my cute UST pic - sorry to my bros and sis from UST as the UP'er in me could not resist (don't get me wrong my sisters were all UST graduates). I love that UST christmas display at the main plaza (which reminds me of pictures of Venetian or Belgian Rennaissance town squares) - just fooling around in front of the camera. I have shown my tree lecture to the horticulture show and 2 landscape classes in UP Diliman. My presentation showcases about 80 species out of the 220 I am tackling in my thesis (there are about 3500 tree species in Philippine forests so my thesis is just the tip of it all). Of the 80, it was katmon or Dillenia philippinensis that got the best response as a landscape tree, soliciting more questions about the tree from my audience. We have a number of Dillenia species (the genus of the elephant apple or handipara from India, Dillenia indica) native to our forests. Some of it, like the katmon, are endemic (not seen in any other place). Dillenia suffruticosa, which is a small shrub, is also native here (as well as a few other Asian countries). I saw it growing in brushes and slopes in Laguna and Quezon. In the PAWB Workshop last November, Dr. Edwino Fernando showed pictures of another Dillenia, D. caulicarpa (or cauliflora? this is what I remember the name mentioned by Dr. Fernando mainly because they saw it with flower on the trunk, cauli in Latin means stem, flora is flower and carpa is fruit - so stem flower or stem fruit). He said it is endemic in Samar. Dillenia philippinensis could well be our country's pride and joy. It is very much endemic. I am not sure of its geographic distribution but I have seen it in forests and gardens in Laguna and Quezon. I was told of an anecdote by Emil Sotalbo about the katmon. In the 70's, then First Lady Imelda Marcos visited Bogor Botanic Gardens in Indonesia and saw the flowering katmon exhibit there. She was immediately captivated by its beauty and asked her entourage to acquire one to bring to the Philippines, not knowing it was indeed a Philippine plant. 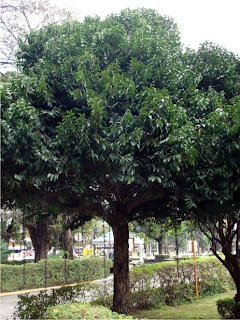 The katmon is a very beautiful medium sized tree which may stand up to 20 meters at an average, but may grow taller. The trees I saw were bushy and compacted with leaves, despite their size. The individual leaves are rather large and thick, with prominent segmentations and serrated edges (typical of Dillenias). Probably what makes the katmon interesting is the display of large white flowers with a deep red center. They measure to almost about a foot in diameter. They bloom early in the morning and wilt by midday, when the sun is very hot and high in the sky. The fruits are big like in other Dillenias (that's why they are called elephant apples). Some parts of the katmon are culturally used. The Bureau of Plant Industries website states that the fruit is sour but has a certain acid flavor. Though its flesh is not agreeably tasty, it is still used to alter fish taste and cooked to a jam. The bark is said to also yield a red dye for coloring. In the horticultural show, a participant stated that the fruit is grinded and mixed with gugo, tanglad and calamansi, used as hair perfume.